There used to be a noted absence of Asian pears in supermarkets, but for the last few decades they have become as common as European pears. One of the more outstanding, the Kikusui Asian pear (also known as floating chrysanthemum Asian pear), is noted for its sweet-tart flavor and the darling flat, chubby fruits. 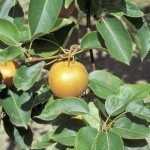 Asian pears prefer temperate to cool weather so if you are thinking about growing Kikusui pears, make sure your climate is right for these wonderful plants. Asian pears are also often called apple pears because, when ripe, they have the crispness of an apple but the flavor of a ripe European pear. Asian pears (or Nashi) are pome fruits similar to apples, quince and pears, but they differ in their temperature requirements. The Kikusui Asian pear tree needs 500 hours of chilling to break dormancy and force blooms. It is hardy to United States Department of Agriculture zones 5 to 8. Some tips on growing Kikusui pears will have you well on your way to enjoying the crisp juiciness of these amazing pears. The floating chrysanthemum Asian pear is a flattened, yellow-green, medium sized fruit. The flesh is creamy white, sweet with just a touch of tartness, finely grained and quite firm. The skin is very delicate, so this pear doesn’t have a good reputation as a shipping fruit but the thin skin makes eating it out of hand quite delightful. With careful packing, the fruit can store for up to 7 months. The Kikusui Asian pear tree is considered a medium season fruiting variety. Ripe fruits can be expected in August to September. The tree itself grows 12 to 15 feet (4 to 5 m.) tall and is trained to a vase-like form with an open center. Kikusui is a partially self-fruitful tree or it can be pollinated by Ishiiwase. The tree should be placed in full sun in well-draining, rich soil. Soak bare root trees for an hour before planting. Dig a hole twice as wide and deep as the root mass and place a cone of loosened soil at the center. Spread the roots out over the cone and make sure the graft is at least an inch (2.5 cm.) above the soil surface. Fill in around the roots with loose soil. Water the soil in well. Over the next few months, water the tree when the surface of the soil is dry. Training and feeding are the next steps that will keep your Asian tree feeling its best and most productive. 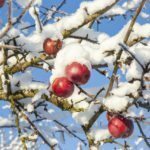 Feed the tree annually in spring with a fruit tree food. Prune the pear tree in late winter to very early spring. The goals are to keep the center open to allow air and light in, remove dead or diseased wood, and form a strong canopy to support the heavy fruit. In summer, pruning is done to remove water spouts or crossing branches as they grow. You may also consider fruit thinning as the little pears begin to form. Often, a branch is overloaded with little baby fruit and removing a few of them will allow the others to develop better and help avoid disease and deformity.